Stilton is a town in Cambridgeshire in England. It is said that the travellers who were staying at the Bell Inn in Stilton made good word-to-mouth advertising to the cheese they were served at the inn on the Great Northern Road. 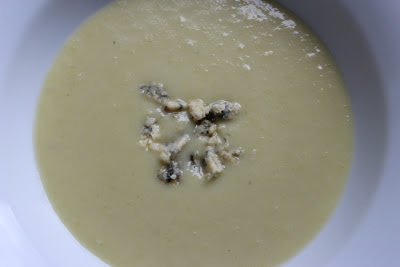 But the Stilton is not from Stilton even though Stilton may have given the name to the famous Stilton. It is said that in the early 18th century the owner of the Bell Inn "imported" it from a cheesemaker´s in a village in Leicestershire. Stilton cheese has the Protected Designation of Origin seal and it may only be produced in Leicestershire, Derbyshire and Nottinghamshire and only local milk may be used. Blue Stilton is best made out of the summer milk, mature for 12 weeks and is said to reach the culinary climax in November. 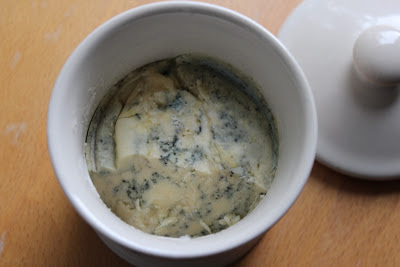 Blue Stilton is sometimes served with port. 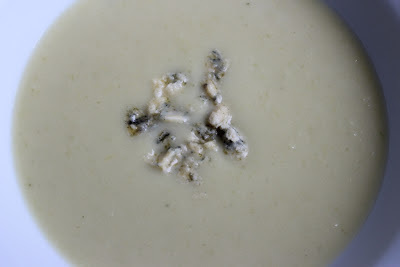 Cooking this soup with port instead of white wine gives the soup the sweet slightly noticeable taste of the port. Heat the oil, add the leeks and cook until the leek turns soft. Splash in the white port wine and cook until the wine has almost evaporated. Then add the potatoes and stock and cook until the potatoes are soft. Puree with the handmixer. Add the cream. Taste for salt. Take off the heat and serve with crumbles of blue Stilton on top. The cheese will melt rather quickly and give the soup its final taste.